Wallpaper showing views of popular tourist destinations in Canada, all centering around the Saint Lawrence River. Rendered as petite watercolor paintings the four views include the Victoria Bridge in Montreal, the Thousand Islands, Falls of Montmorency, and the Lachine Rapids. Completed in 1859, Victoria Bridge links the cities of Montreal and Saint-Lambert and greatly facilitated transportation between the two. The Thousand Islands consist of 1864 islands of varying size, with each measuring at least one square foot of land above sea level. The Montmorency Falls, on the Montmorency River in Quebec, are 275 feet tall and run into the St. Lawrence River. A suspension bridge over the falls provides spectacular views. Lachine Rapids are a three mile stretch of rapids on the St. Lawrence River between the Island of Montreal and the south shore, which created a difficult passage for boat traffic. This illustration shows a sidewheeler, the first steam-powered boat, working its way down the rapids. The use of framed images in wallpaper designs became a popular trend after mid-century, probably in response to the British Reform Movement. Proponents of the movement thought the use of landscape scenes and tromp l’oeil effects on wallpaper were dishonest and belied the 2-dimensioinal aspect of the wall. Putting the scenes within a frame made them appear more like paintings than windows or other openings in the wall which seemed to have appeased the conformists. The fact that this paper was printed by machine which necessarily involves thin pigments and a certain amount of color bleed helps add to the watercolor effect by softening the edges of the different printed colors. 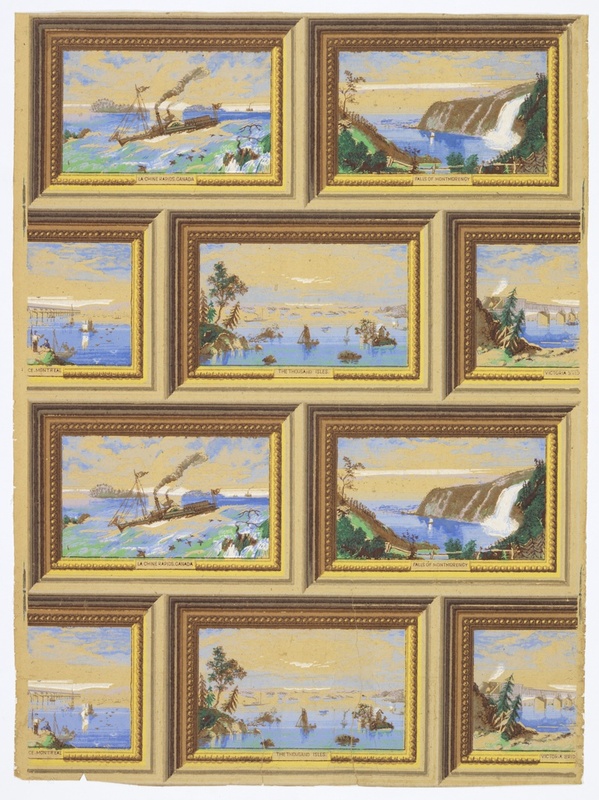 Inspired by the Grand Tour in the eighteenth century, and the American Grand Tour in the early nineteenth century, wallpapers have illustrated and profiled technological innovations and natural scenic wonders. This paper combines the two by including the Victoria Bridge and the sidewheeler along with the beautiful views along the St. Lawrence River.